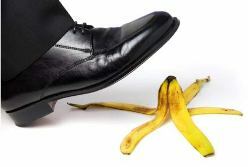 Our frantic actions might increase the frequency with which things don't go according to plan but reduced preparation and planning time also increases the risk of failure still further. The number of failures we have must go up! Some people say "these are not failures, they are learning opportunities". Any lessons worth learning must be captured but if we did not achieve our objective then we failed. What we have to do next is to pick ourselves up quickly and try once more. In many cases it is our starting point that is a major weakness. Have we got our Innovation Strategy right? At what point do we commit energy and resources to bringing a new idea to market? Often the test is whether the new idea has potential for creating value for the organisation. Unless you have started a business from scratch, providing resources for your new idea may remove resources (people, money, materials) from other areas of your business. The question you must ask is not just 'will it work?' but 'can we get it to work without any damage being done to our current business?'. Our Innovation Strategy is thus firmly tied to our long term objectives. New ideas are complex. They are often generated to solve a problem but to get an idea to market may provide further challenges. A new drug may cure a disease but it may have side effects, be expensive or difficult to package or have a short shelf life. To create value you need to show how your new idea will create value for your customer perhaps through time, cost or efficiency savings. You cannot simply say, 'Here is the new wonder drug' and expect hospitals to be placing orders immediately. A huge potential problem area is the window in time where your idea or prototype is turned into reality. Your development team throw the idea over the wall into production and think 'job done'. Until you are selling gizmos buy the lorry load, everybody should still be contributing although the balance will change. You will need more human resources than you thought and also more cash. There is also a danger of stagnation as your new product or service falls into the gap between development and production. A highly motivated and charismatic leader is needed to ensure to see things through. Do you have everything you need to get your new idea into the market? Have you considered external partners, especially if this might improve your success rate? Even if you have, how ready are you in terms of a) people b) protecting intellectual property? Sometimes the 'missing ingredient' needs to come from elsewhere. To have a shared understanding with one or more people it helps to understand they are not using the same map as you are. So NLP tells us that “the map is not the territory", it is our individual interpretation of the territory. Great, NLP folks can tell us something useful, but how is this useful to us? Being relatively new additions to the business leader's toolkit, creativity and innovation are topics that inspire a huge number of articles and books to be written. Some of these contain insights and wise words but many are 'how to' books. Remember that these are 'maps', somebody else's perception of what is happening/has happened in the past. Not only are many context specific but much information is often left out. Remember that to explore new territory you need to obtain or create a map especially when passing on knowledge to others. How often has the CEO's speech been misinterpreted because employees do not share the same perception or vision of the company? 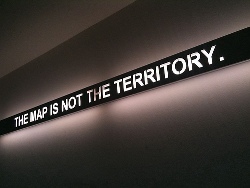 Never forget that "the map is not the territory".